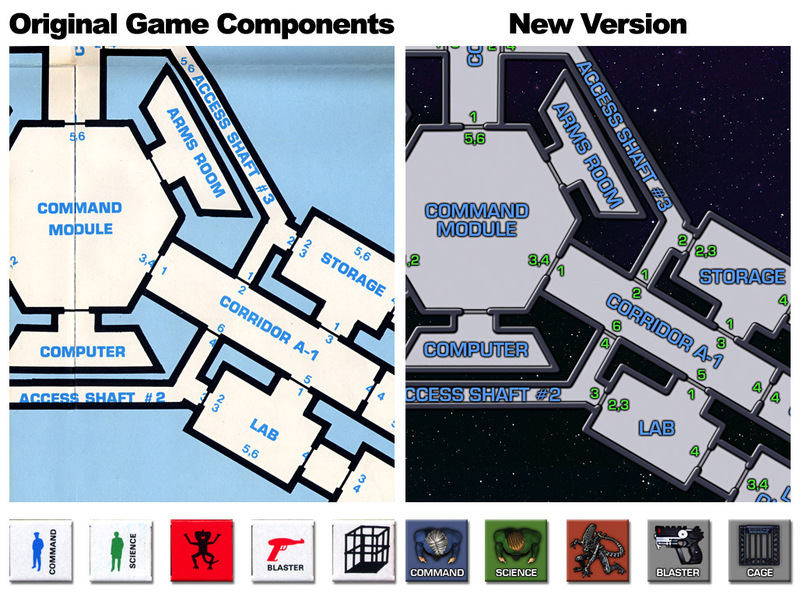 The “Intruder” Game Box is an updated and enhanced digital version of a long-out-of-print game. It is being re-published for use with BGE with permission from the original designer (and current copyright holder), Dennis Sustare. 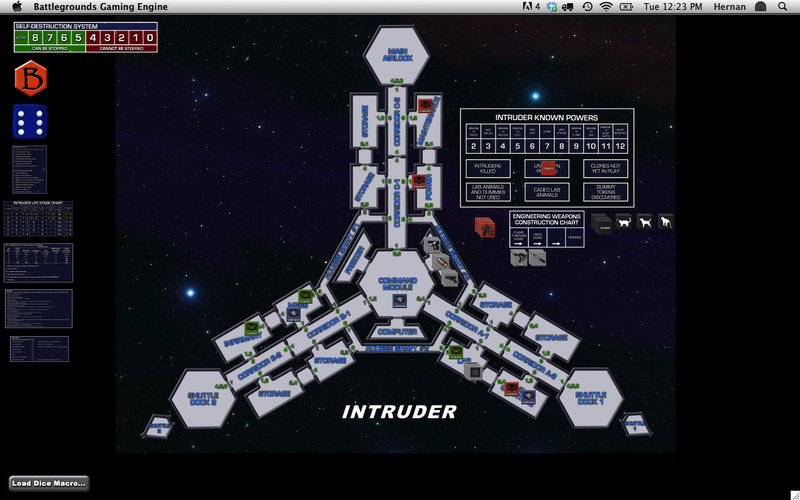 Originally published in 1980 by Task Force Games as one of their Pocket Game series, “Intruder” is a 1 to 3 player science-fiction game of terror and suspense aboard a deep space station. The game includes tokens representing the crew and their weapons, lab animals (which confuse the search) and the Intruder. 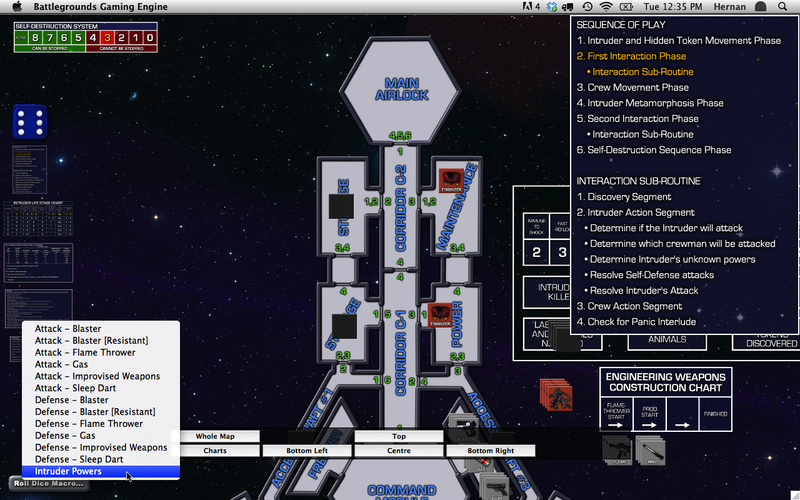 The gameboard shows in detail the interior of deep space station ‘Prometheus’. 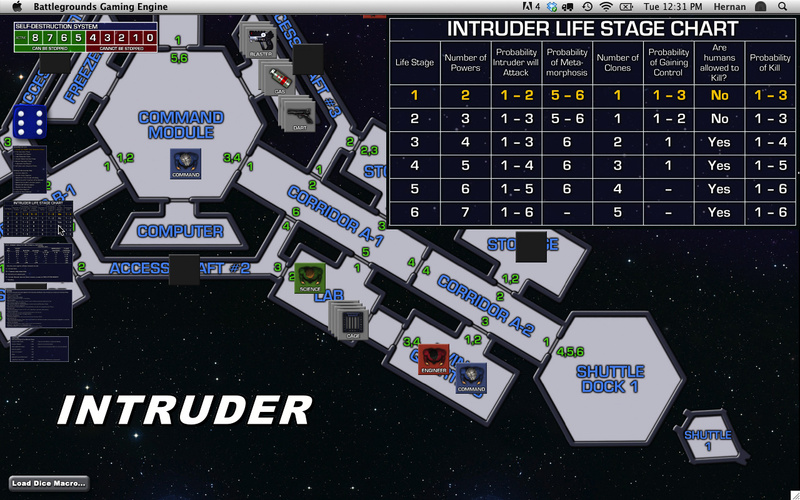 The gameboard also contains special charts to record the development of the Intruder. I invite everyone to download the first six pages of the 30-page rulebook to learn more details about the game and to see if it peaks your interest. So what exactly is a “Game Box”? Game Boxes for BGE are simply a distribution package, which includes an artpack containing the playing board (generally a map), digital tokens (in lieu of cardboard counters or plastic minis), and the game’s charts and tables. Game Boxes will also include the following files (where applicable): dice macros, Game Files and Deployment files, custom Turn Sequencer settings and Preferences, a rulebook in PDF format (searchable), and installation instructions. In short, everything needed to play the game if you already have at least one Gamer Client license (BGE v1.5 or higher). For multiplayer games, the extra players do not need to purchase the Game Box, but they will need a Gamer Client of their own, or they can use the free BGE Demo if the person hosting the game session has enough free Player Slots available for them to use. Hopefully those screenshots will give a good idea of what it’s like to play the game in BGE.